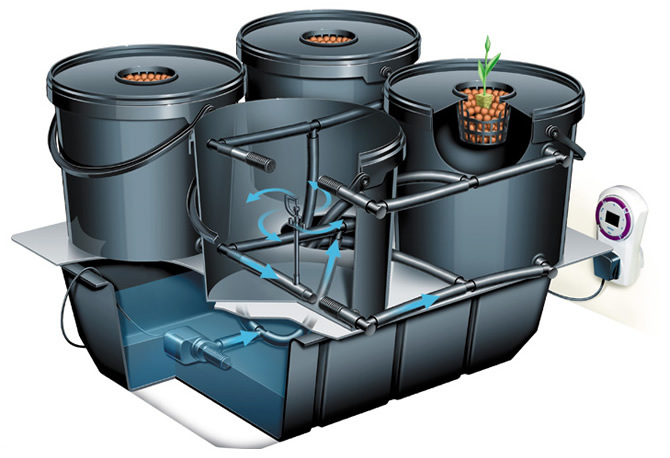 This technique is a variation on an aeroponics system. The principle of true aeroponics works by creating a fine mist of nutrients sprayed inside a tube or container in which the roots of the plants are suspended. So, in effect the roots are fundamentally hanging in air supported by the bare minimum or medium, i.e. a net pot with either clay pebbles or rockwool. The roots are then constantly sprayed with a fine mist via a very powerful pump. In principle, this is the definitive technique as the mist itself absorbs very high levels of oxygen plus the roots are hanging in air, resulting in the absolute maximum aeration to the root zone. However, in practice the majority or aeroponics techniques fail and fail miserably. The reasons for this are that the basic principle of making mists which have dissolved salts (nutrients) in it is flawed. Salts precipitate; this cannot be avoided, so over a short period of time salts build up on the misters restricting the flow of mist to the roots. If left unchecked, then total blockage occurs. Again this effect is amplified if you are situated in a hard water area as much of the UK is. The calcification of the water accelerates the blocking of these misters. The end product is total break down or constant daily management of the system, sometimes even hourly! So in theory as a drawing and an idea, it’s unbeatable, but in practice as a workable system the conclusion is failure. If this was the first hydroponics technique that was invented we would possibly not have hydroponics as we do today. them normally results in success and not failure. So that is what was done. The aeroponics pod system instead of using a mister uses a spinning high frequency sprayer. The sprayer delivers a constant fine spray direct to the rootball of the plants, and as the sprayer is spinning at a high frequency, the spinning motion stops any precipitation of salts or calcification of the water on the sprayer resulting in no blockages. Also, through its own action, it uptakes lots of oxygen in the process; ok not as much as a mist would but compared to most hydroponics systems, its leaps and bounds ahead of them. The roots hang in air, which again provides great aeration to the rootball. This system also incorporates all the safety features and flexibility of the original pod system. This system offers good versatility as the lids are interchangeable. 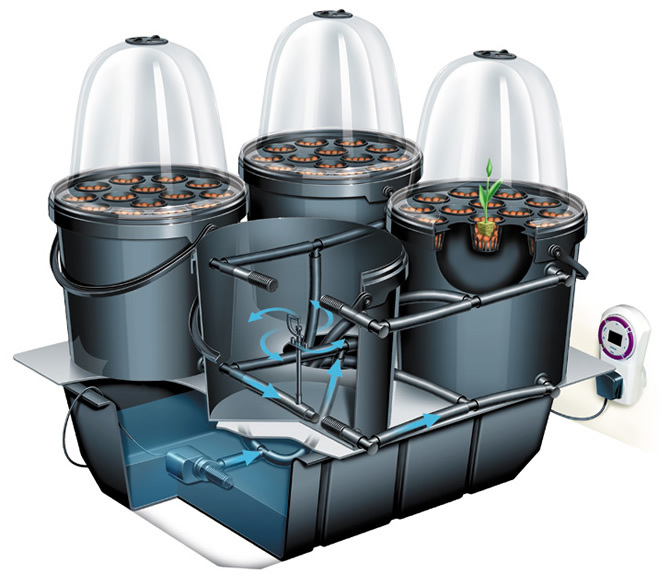 These systems can be used as an automated propagation unit, which can allow you to propagate up to 8 plants per pod! Or you can use it to propagate and grow to full maturity 1-3 plants per pod. AeroponicPod™ System. Designed, invented and manufactured by Esoteric Hydroponics Limited.